Each day more people start their work-at-home journey. Some choose it when more traditional career opportunities fail. Others crave the freedom that this type of work brings. Not having to get up, get dressed and go out in the morning can be quite appealing! That's just the tip of the work-at-home iceberg. The time savings, money savings and the increase in family and personal time are all meaningful motivations to find a way to work from home. It doesn't matter if you want a full time job or just want to make extra money. The real opportunities for online income are growing by the day. Some of the jobs listed by companies in this book are so simple and easy to do that you'll be earning money in the first week. Others require more of a time investment, dusting off your resume and possibly a small monetary investment for a headset or compute software. There are many options in this book and the best part is that you get to decide how much you want to work and the type of work that might be suitable for you. My husband and I have lived well and raised a large family from online, work-at-home income for the last ten years. One of the best aspects has been the freedom of a flexible schedule and even the ability to earn income while traveling. Once you experience this you might never want to work any other way. We certainly don't. 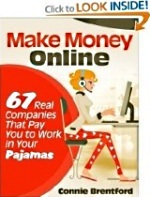 67 Real Companies That Pay You To Work In Your Pajamas was written to save you a tremendous amount of time. After reading this book you should know what direction you'd like to take on your work-at-home journey and you might fins the perfect company to work for right in its pages. The companies listed all offer real ways to make income and many of them like Amazon, U-Haul and Pizza Hut have been around for years. This is not a book about different ways to make money online by starting an online business for entrepreneurs, although after working for some of these great companies you might decide you have the skills to do just that. The companies in this book, should they hire you, will pay you at regular intervals from the beginning of your hire. It's the same as if you get hired by the traditional go-to-work company but you have no commute and you show up in your bathrobe and slippers. Some companies listed here offer paid training, paid vacation time and include medical, dental and vision benefits. Some even have tuition assistance programs to help you continue your schooling. It is my wish that after you read this book you will realize that working from home is a viable option for you. There are real companies you've heard of that will pay you as a valued employee or independent contractor to help them run their business. Many of these companies have a comprehensive benefit package, guaranteed full or part-time work and they will consistently work around your life schedule. This is practically unheard of in the traditional work setting. Companies are realizing that work-at-home employees are more productive and happier than traditional employees. It's your time to start your work-at-home journey now. I've scoured dozens of work-at-home forums and websites not just for the job information but for the jobs that are recommended by people doing the work. I want you to have good, solid information to start your work at home transition today.